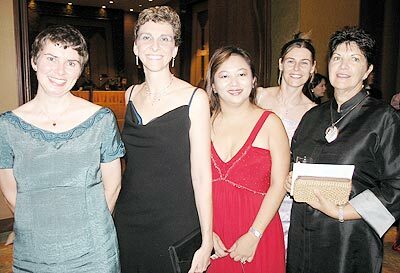 Teachers, parents and supporters of the Prem Tinsulanonda International School hold a glamorous Ball at the Shangri-La Hotel. On Saturday March 15, the eagerly awaited Annual Prem Dinner Dance took place amid the luxurious surroundings of the Grand Lanna Ballroom at the Shangri-La Hotel in downtown Chiang Mai. Organised by the Parent Student Association at Prem Tinsulanonda International School, (to give this excellent educational establishment its full and impressive title…), this glamorous event was attended by more than 100 people associated with the school and its students. 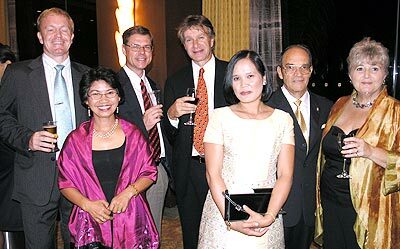 All enjoyed a wonderful evening of excellent food, drinks, entertainment and prizes in a perfect setting, and together raised over 98,000 baht for the school. The entertainment itself included a cabaret act from Anline Takeuchi, a demonstration of Latin Dance by members of the Peeresak School of Dance, and two sessions of live music, (including several encores! ), from the band “Alchemy Pops”. The extraordinary and much appreciated generosity of the various sponsors of the evening provided more than 250,000 baht’s worth of prizes, ensuring that every guest went home with at least one prize! Dinner Dance at the Shangri-la Hotel. The Ministry of Tourism and Sports is co-operating with the Ministry of Agriculture and Co-operatives and the Horticultural Science Society of Thailand to convert the 75 hectare Royal Garden and Royal Pavilion in Chiang Mai into a public multi-functional park. At a press conference on March 10, the Minister of Tourism and Sports, Weerasak Kowsurat, announced that whilst the venue came under the purview of the Ministry of Agriculture and Co-operatives, the Ministry of Tourism and Sports would, in future, be involved in its promotions and monthly campaigns. Plans for the park include a meeting and incentives venue, a horticultural knowledge centre, a sports complex and a northern area cultural centre. A training course on preliminary protective measures in the event of chemical, biological, radiological or nuclear attack was held beginning March 17 at the Public Disaster Prevention and Relief department on the campus of Chiang Mai University. It was attended by Disaster Relief and Prevention volunteers together with police, army and local administration officers from the 8 northern regions. The Deputy Director General of the department, Phongphao Katethong, stated that many countries worldwide are developing chemical, biological, radiological and nuclear technologies using and producing materials which are highly toxic and have enormously destructive capabilities. Thailand, he felt, is at risk of experiences such disasters as a result of terrorist activities, particularly in the three southern provinces of Pattani, Yala and Narathivat. Thousands of civilians and military personnel have already lost their lives in these areas. This, the 5th presentation of the course, was supported by the department itself and also by Canadian donations and the participation of Patricia Atkinson and four of her team members. Both theoretical aspects and field application were studied, and it is hoped that the knowledge gained will be transmitted by the participants to local authorities in their home areas. The participants get ready for the Rincome Rally. The early hours of Saturday March 15 saw the start of the 12th Annual Rincome to Angkhang with over 180 people and as many as 49 cars taking part. 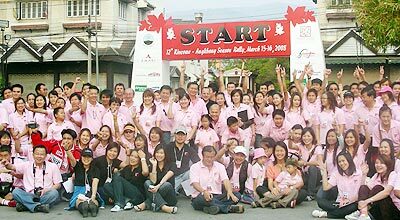 At 8 am, the Director of Tourism of Thailand, Junnapong Saranak, declared the largest rally so far held, “up and running”! The event lasted all weekend, with an overnight stay at the picturesque Angkhang Nature Resort, part of the Royal Foundation Project. A direct journey to the resort takes 3 hours, however, there were plenty of games, tricks and turns to occupy the contestants. The winners of the Rally Competition were Phakphoum Diewtrakul and Chairat Roosue, who were awarded the Prince Bhesadej Rachanee Trophy, 5000 baht cash and a camera from Samsung. Prizes were also awarded to the drivers who gained second and third places in the competition. During Saturday evening, other games and contests were set up for participants to enter if they had the energy, alternatively they could just relax and enjoy the delightful surroundings of one of the most beautiful places in Northern Thailand. If any readers would like to take part in next year’s contest, please contact the Amari Rincome Hotel for further details. 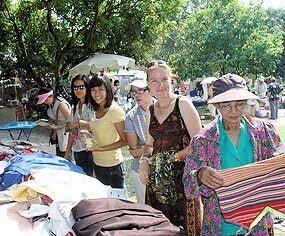 Following the success of the Yard Sale held at the end of last year in the City Life gardens, a welcome repeat was organised for Sunday March 16. Prior to the event, many kind people donated their unwanted clothes, book, DVD’s and household items to be sold to benefit the next Hillside 4 Charity Rooftop Party. Everyone had a great time at the City Life Garden Party. Over 20 stalls came to set up, including the amazingly successful second-hand clothes stall manned by Sally and Jo, two delightful ladies who could, between them, sell a very large fridge to an Eskimo in the middle of an Arctic winter! They didn’t have to work that hard on this occasion, however, as local residents descended on the stall at 10 am as they were setting up for an 11 am, opening and practically cleared it! Amongst the other stalls, JJ Markets, La Luna, ArtSpace on 7 and Magnolia had great days, and, as usual, the ever-popular Fashion King were there to support the Rooftop Party. Lanna Dogs, the rescue charity, came for the first time, and delighted everyone with their pups, two of whom were adopted and are now living it up in their new, loving homes. A good number of donations to Lanna Dogs were also gratefully received. A new innovation at the Garden Party, music and dancing, made the whole event “go with a swing”, and was much enjoyed by visitors. The School for the Blind played throughout the day, and children from the Healing Foundation gave dance performances. The School for Life kids were there too, and gave a traditional Thai Drum and Dance routine. One of the highlights of the day’s entertainment was Bradley Dean Whyte with his guitar, plus his very enthusiastic friend from the Healing Foundation, who delighted the listeners with their songs! A delicious and welcome selection of food and drink was provided by The House Restaurant, the Wine Gallery, and Tusker’s Bar, complemented by Wit from Witty Ice Cream’s delectable home made ice cream and cones. For anyone who missed this treat, or absolutely has to repeat the experience immediately, he can be found at the Sunday Walking Street Market. A very successful day, overall, with over 25,000 baht raised to start the fund for the 2009 Rooftop Party charities, not counting the money raised by other participating charities at the event. At the end of the day, the remaining unsold clothes were collected and taken to Wat Suan Dok for distribution to Hilltribe villages. None of this would have been possible without the support and help of Pim and her team at City Life; grateful thanks and much appreciation of their efforts go to all of them from all of us. The all-time best selling book in Chiang Mai, ‘Farang, Thailand through the eyes of an ex-pat’ and written by the Chiang Mai Mail’s Dr. Iain Corness is back on the shelves after a four week shortage. The book, which had been the number 1 local top seller for 16 weeks straight, caught the suppliers short-stocked and with the book having been published in the UK, there were inevitable delays in getting more stock to Thailand. It was then found that the initial print run had also been already distributed, so a second printing had to be hurriedly arranged through the UK printers. At one stage it looked as if the second print run would be done in Thailand to cut down freight time and travel costs, but in the end it made more financial sense to continue with the British printers. ‘Farang, Thailand through the eyes of an ex-pat’ is now available once more and Dr. Iain advises that he is always happy to autograph your copy.